DR Ian Abbott may be semi-retired but that has not slowed his enthusiasm for the field of ecology. The West Leederville resident played a pivotal role in the new volume from the WA exploration series, The Finest Goldfields in the World, documenting Robert Austin’s 1854 Murchison River expedition. Dr Abbott’s research compiled the Noongar names of animal species in the south-west of WA and was used to identify animal species observed by Austin. During the 1854 expedition, from Avon Valley to Mt Magnet and Shark Bay, Austin recorded 36 species of native animals, which Dr Abbott identified by their Noongar names. Invited by the WA Exploration committee to join several years ago, Dr Abbott volunteers several hours of his time each week. “The team gets on very well and everyone brings their own competence to the project. “I was asked to join just as they were finishing the first volume to help identify animal and bird species,” he said. The book uncovers many species that were thought to be extinct, including the recently rediscovered night parrot. “Austin’s expedition runs parallel to the other volumes because it was too big to be included in the others,” Dr Abbott said. The volume was released this year and is available online. 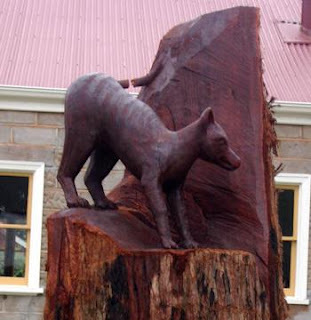 Down Under in Australia's capital, Canberra, politicians have authorised the creation of a cryptozoological statue! And what creature will they be immortalising in bronze? Why, the bunyip, of course! 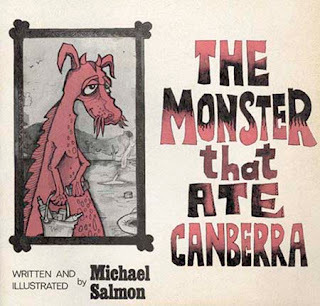 The bunyip has a special significance for Canberra, as the nation's capital was the setting for Michael Salmon's iconic children's book The Monster That Ate Canberra (pictured above at left). The book's key character was a disgruntled bunyip forced from his billabong home by man-made pollution. 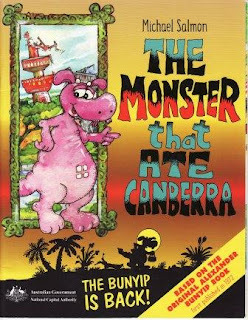 Angry, the bunyip seeks revenge by 'eating' Canberra, taking bites out of monuments. It was probably the first book with a 'crypto' theme that this writer ever picked up to read, and holds a cherished place on library shelves throughout Australia. The bunyip statue is by no means the first crypto creation of its kind, but it may be the first government-funded one! There is a yowie statue at Kilcoy, in Queensland, and the giant crocodile at Wyndham, also in Queensland, that we featured on this blog a few weeks back. There are doubtless a couple more we are unaware of - if you know of any in Oz, send them in! We've spent almost a decade 'hunting' big cats Down Under, travelling all over the country to collect reports, set up game cameras in many locations in eastern Australia, investigate unusual animal kills, research historical accounts - we've lived and breathed anomalous felids. So of course when we visited the UK we had to get a feel for the local terrain, and the 'indigenous' mystery cat phenomenon. And who better to take us on our first big cat excursion than Dorset's top ABC (Anomalous or 'Alien' Big Cats) expert and naturalist, Jonathan McGowan. We met Jonathan at the Weird Weekend, where he had set up a breath-takingly good display of tracks, predated remains, exotic cat skins and a stuffed Wildcat hybrid. Jonathan is also a taxidermist, who also collects, stuffs and occasionally eats (!) roadkill from Britain's country lanes and busy arterial roads. A few days earlier Jonathan and several other CFZ folk had gathered suspect animal hairs from nearby Huddisford Wood for testing by visiting Danish zoologist Lars Thomas. While the hairs were being tested, and many Weird Weekend attendees were still having their breakfast, we embarked on a morning exploration of the area with Jonathan, Mark North, Andrew Perry, Silas Hawkins and Dave Baldwin. At first glance, those gentle rolling hills of Devon were deceptive. Easy, we thought. We'll be drinking ginger beer and eating lashes of tomato sandwiches before too long while we amble along level country lanes. Bogs aren't unique to the UK, but they're certainly uncommon in our part of the world where it seldom rains enough to create the kind of quagmire that could rival 'quicksand' as a possible way to die. OK, I'm exaggerating slightly. But hidden behind the hedges and nature corridors lining the picturesque green fields were bogs of an unGodly nature, and we weren't really prepared. In fact the only person who seemed to sense the mud before we were forced to walk through it was Silas, who had sensibly donned a pair of wellies. we spotted many cloven hoof tracks indicating the local deer population was active and quite healthy. Actually, in the UK right now a deer explosion is underway - plenty of food for any big cats on the prowl! Thankfully there were some nice level country lanes in the end, filled with native flowers and herbs that attracted a colourful array of butterflies and bumblebees - and perhaps fearsome felids. Jonathan, who spends much of his time monitoring wildlife and rambling across rural properties and nature reserves, identified several cat scats choc-full of bone and fur. And back in the lab, the hair analysis had turned up an interesting result. Lars Thomas had identified the hairs as leopard! Was there an exotic cat monitoring our movements that morning? Of course hair analysis alone - while hair is quite unique, like a species fingerprint - is not enough. It should be followed up with DNA analysis, and it's my understanding there are moves afoot to do this, if it hasn't already been done. merit. We believe in our case the net was not cast wide enough to include exotic species. That aside, the announcement caused an understandable ripple of excitement at the CFZ's Weird Weekend. Post-conference we caught up with Rick Minter, a big cat researcher based in Gloucestershire, who met up with us in Stroud and took us to a few big cat hot spots. He later shouted us lunch at a nearby gliding club, where he also took us through a presentation on the case for big cats in Britain. It was a great day, and a very instructive one. Both Jonathan and Rick are obviously doing some great work, and are quite passionate about the subject. And it was a nice postscript to our book launch, which was a sell-out! Reports have emerged that Bali's extinct tiger, Panthera tigris balica, may not be done and dusted after all. Residents of the community of Dauh Siong at Lumbung Kauh village near Tabanan, West Bali, are becoming increasingly gripped by fear following the still-to-be-confirmed news of a tiger attack. 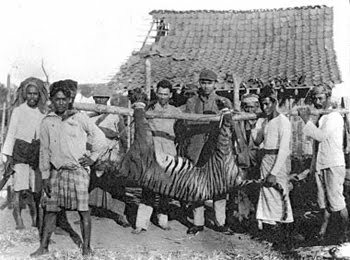 The possibility of a tiger attack in Bali is viewed with some incredulity in light of the belief that the last Bali tiger was shot in Sumbar Kima, west Bali in 1937 (the pictures accompanying this post date from the early 1900s). The smallest of all eight subspecies of tigers, the Bali Tiger weighed between 90-100 kilograms with a length of approximately 2 meters. Fears that tigers may once again be on the prowl in Bali's west have been fed by the savage mutilation of several dogs and a goat. Adding credence to reports is the eye witness account of local villager, I Made Pariawan Mardika (37), from the Dauh Siong community who told Beritabali.com that he saw a tiger attack his dog on Wednesday, August 4, 2010. He described the tiger as being about 1 meter tall and weighing 70 kilograms. The man told the press how he was cutting grass to feed his livestock in a location some 200 meters from his home at 9:00 a.m. when his dogs, who always accompanies him, suddenly disappeared. At 11:00 a.m. he returned to the field, calling out his dog's name. As he walked he heard a yelping dog which led him to a clearing where what described as a "red-orange tiger with yellow accents and black stripes" was biting the hind quarter of his dog. 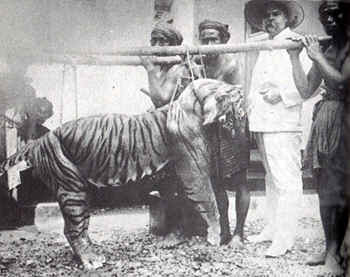 The farmer's description meshes to some degree with records of the Bali tiger which was said to have short hair that was of a deep orange color with darker, fewer stripes than other tiger species. Confronted by a tiger having a meal, Mardika said, "I was face to face with that tiger for around one minute; I couldn't scream, I was so scared." The tiger reportedly abandoned the dog and walked into the protected jungle area of Tukad Balian Patok Nagasari. The terrified farmers did not pursue the animal and returned to his home where, he confesses, memories of the sighting still disturb his sleep. Later, that same day, the farmer's dog returned home bearing bite wounds and patches of missing fur. The farmer said the dog now refuses to follow him outside the family compound. In a separate but potentially related incident, a goat owned by Made Sumadi (37) of neighboring Banjar Nagasari, who discovered dead in a ravine with bites to its neck and hind quarters. Some have speculated that the tiger sightings may be the result of the unconfirmed release of once captive cats some years ago into West Bali by Bali's Conservation Society (KSDA). Village authorities are advising local villagers to exercise caution and travel in pairs when visiting forested areas and their agricultural fields. The chief of the West Selemadeg police precinct, I Nyoman Suarnata, has sent officers to the area and contacted the Bali Safari Park in Gianyar for technical advice and assistance. In a related story, officers of the Bali Conservation Agency (KSDA) deployed field staff accompanied by forestry officials on Sunday, August 8, 2010, to search for the mysterious tigers in wooded lands around Lumbung Kauh village in West Selemadeg. Selemadeg precinct police commander, I Nyoman Suarnta, confirmed that searches were conducted in the communities of Dauh Siong and Nagasari with officers from his jurisdiction also participating. Disappointingly, efforts to find further evidence of the tigers proved unsuccessful. So were back in Australia now, jet-lagged and busy keeping an eye out for spiders after spending time with Bugfest's Nick Wadham and his eight-legged friends, and chatting with author Carl Portman about his interest in Australian arachnids. While the Weird Weekend didn't start off as an entomological excursion for us, it certainly seemed to end up like one - helped along by Mike's passion for bitey bugs. You'd think after two weeks away the place would be awash with large, nomadic Huntsmen spiders, but (thankfully, I say) the cold weather has kept them at bay and out of the loungeroom! It's always exciting talking to people about their passions, and while I am no spider lover, even I came away with a new respect for the bigger spiders - especially the ones that live for 25-30 years (yes, really! A spider hater's nightmare!). So spending time talking to Nick while he had a dinner plate-sized tarantula on his wrist (I admit, I was actually standing about five feet away) was a very different and, dare I say, fun experience. Mike is pictured above getting up close and personal with Nick and one of his giant hairy tarantulas (just after the tetchy tarantula lowered its front legs and relaxed its fangs). Nick's business Bugfest is insect education, and he and his wife Kara exhibit their Insecta menagerie all across the UK. They don't just have spiders of course - they also keep giant burrowing cockroaches (incidentally, one of the latest pet crazes), stick insects, moths and other creepy crawlies. Bugfest is immensely popular with children and provided a nice counterpoint to much of the other material discussed and on display over the weekend. We didn’t have nearly enough time to catch up with everyone we wanted to see in the UK, and of course not everyone could make it to the Weird Weekend in picturesque Woolsery in North Devon. So our chat with Carl Portman, author of A Daintree Diary, was not nearly long enough, but his Weird Weekend presentation on the Australian Whistling Spider was funny and entertaining, and his passion for arachnids, and Australia, was not only obvious but inspiring. Carl hopes to come back to Australia sometime soon, and we hope he does come and stay with us - we think we might have swayed him to return with the promise of finding Funnel Web Spiders in the Blue Mountains! 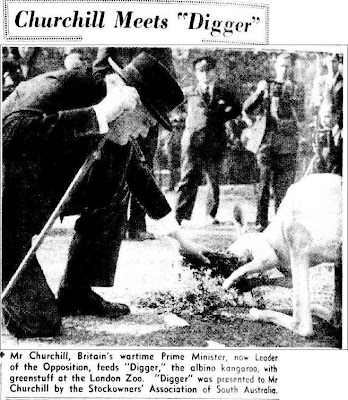 It’s funny to think what he viewed as a somewhat elusive quarry on his last visit Down Under is probably creeping around our garbage bins as I write this - a great example of how we can take things living right under our nose so for granted. Putting the shoe on the other foot, our visit to the UK afforded us a glimpse of some indigenous wildlife that elicited plenty of ‘oohs’ and ‘ahhs’. Our excellent hosts at Hilltop Holidays - Kaye, Roy, David, Ross and Greg Braund-Phillips - undertake wildlife rescue work, and have some interesting animals in their care, and frequenting their farm, including hedgehogs (did you know they hiss like snakes when they’re annoyed? ), squirrels, barn owls and deer - and an impressive Harris Hawk named Mars! But by far one of the most interesting menageries we glimpsed was within the walls of CFZ HQ itself, which boasts an array of aquatic and amphibious creatures that would delight any aquarist’s heart. Oll Lewis guided us around various aquariums, terrariums and enclosures, pointing out giant cockroaches, livebearers, and eel-like amphibians and turtles with soft shells and red ears. Memorable stuff indeed, and enough to fire the imagination of any young budding naturalist. Further afield we encountered numerous ‘badger sets’ - including within the hallowed grounds of Glastonbury Abbey! Sadly the only badgers we saw during our trip were road kill (three in all). Despite being protected, they are frequently killed by farmers, as they spread tuberculosis to livestock. It was also exciting to get out into the British countryside and walk through some of the farm paddocks and forests of Devon and the Cotswolds. Tune in for our UK big cat write-up - our brief but memorable taste of big cats in Britain. We're pleased to say the Weird Weekend was brilliant! We joined an interesting cast of speakers spread over three days, talking about everything from big cats and orang pendeks to UFOs and the Holy Grail - quite a mash-up, but one that ensured there really was something (weird) for everyone. We were told numbers were down, but there seemed to be more than enough people speaking, filling the pews in each talk and keeping the bar and book tables busy. In fact the books for sale were hard to walk past. The CFZ had a heaving table of books on offer, some of them recently authored by speakers at the Weird Weekend - namely Irishmen Ronan Coghlan and Gary Cunningham (The Mystery Animals of Ireland), Andy Roberts (The Berwyn Mountain UFO Crash), Carl Portman (A Daintree Diary), and Richard Freeman (The Great Yokai Encyclopedia). We were deeply impressed by the quality of the covers (and the contents!) 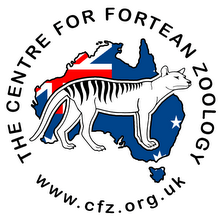 - it’s great to see the CFZ press going from strength to strength, inspiring many researchers to put their work into the public arena. And the knowledgable men from APRA secondhand books were on hand with an esoteric selection of cryptozoology, folklore, earth mysteries, the occult and paranormal tomes, many of them hard to get. They even purchased two of our books, but just for the record, I think we probably purchased three or four of theirs! From our perspective, our presentation on Australian Big Cats was well received and we sold out of the books we brought across to the UK for the conference. We ran slightly over time, which left no time for questions, but we spent the remainder of the weekend catching up with those keen to discuss the presentation and the contents of the book. We weren’t the only speakers with a colonial flavour. UK arachnid enthusiast and amateur entomologist Carl Portman gave an interesting and passionate account of his time chasing Australia’s Whistling Spider, a type of tarantula, which he writes about in his new and highly recommended book, A Daintree Diary. And Danish zoologist and hair analysis expert Lars Thomas tantalised the assembly with a mystery animal skin that just could have been a Tasmanian Tiger hide, although subsequent analysis revealed it to be the skin of a Zebra Duiker (Mike is pictured holding the skin), a small African antelope with a somewhat deceptive pelage. Lars had a documentary crew in tow who happened to be making a film about him and his work for the Danish equivalent of the nature/science/discovery channel. Which was lucky as perhaps one of the biggest events of the weekend was the positive identification (by Lars) of hairs collected from Huddisford Woods as ‘leopard’ (which we dubbed the Woolsery Leopard). An astounding development! The hair ID certainly takes big cat research up a notch, and is a credit to those involved - the CFZ crew and colleagues Lars Thomas and naturalist and big cat researcher Jonathan McGowan. Jonathan very kindly took us on an excursion to the same location where the hairs were found, testing the mettle of the Aussies who had previously been (good naturedly, of course) dismissive of the physical challenges of the English countryside. Several bogs, fields and a forest later, we had a newfound respect for those deceptively gentle rolling hills. It was certainly never dull! Over the next few weeks we’ll be posting up additional bits and pieces from the weekend. But we’d like to say a BIG thank you to the CFZ crew for staging such a memorable weekend - it’ll be hard to top it! A saltwater crocodile found in the Northern Territory has been described as a "freak of nature". 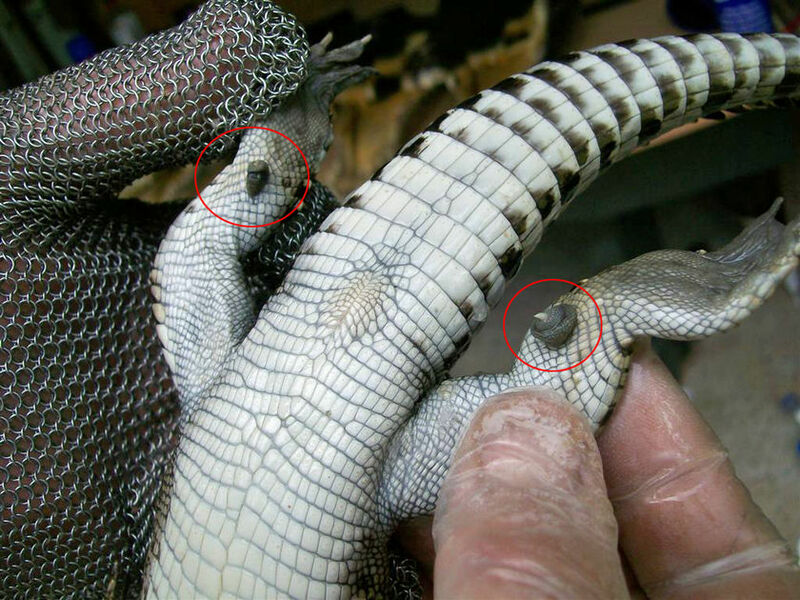 The half-metre long reptile has sharp spurs protruding from the underside of its back legs. The five millimetre-long spurs connect to a bone stemming from the crocodile's ankle joint. "I don't know whether a croc's been playing up with a platypus or not, but it looks a bit funny, I reckon," said crocodile hunter and taxidermist Mick Pittman. Mr Pittman, known as "Crocodile Mick", says he and his family have been in the crocodile industry for 53 years. He thinks the spurs might be mutant toes. "Pete, Paul and Simon wrote this tune for a number of reasons; to pay homage to a beautiful and remote landscape, and to honour those hardy souls who spend days, weeks, scouring the more inaccessible parts of Australia's vast interior for this very elusive and enigmatic bird - all in order to gain some understanding of its ecology, distribution, movements, threats....snippets of information that might help it persist. "We also wanted to capture in music and words the mystery of a bird that has been pushed to the edge of extinction and yet still occasionally surfaces in far flung parts of this arid land. "Most of all we wished to distil the message that by gradually unravelling and diminishing the natural world we are diminishing ourselves." 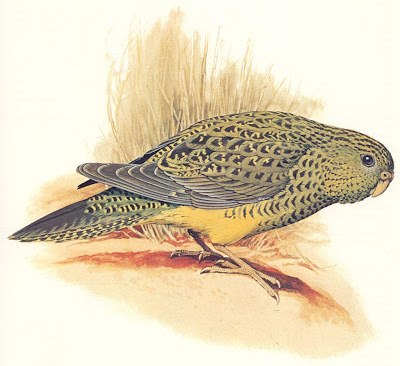 Find A CFZ visual and audio tribute to the Night Parrot here. 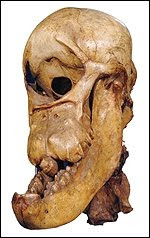 Although this skull was once said to belong to the mythical Aboriginal creature known as a bunyip, it was identified by the naturalist William Sharp Macleay (1792-1865) as nothing but a horse, deceptively presented to fool the credulous. It was part of a major collection that eventually formed the Macleay Museum, assembled by three members of the Macleay family. This has been housed in purpose-built accommodation on the University of Sydney campus since the 1880s. Celebrated for its holdings in entomology, ethnography, scientific instruments and historic photographs, the museum can trace its origins back to 1826, when Alexander Macleay was appointed colonial secretary for New South Wales - and brought with him one of the largest privately owned insect collections in the world. It was developed by Macleay's son William Sharp and nephew William John, whose passion for taxonomy included a particular interest in intestinal worms. The latter would scour the fish markets for novelties and purchase specimens from local naturalists and "bird stuffers". A monster 6.5m croc was killed by locals in a remote Territory Aborigine community because it was killing their cattle. 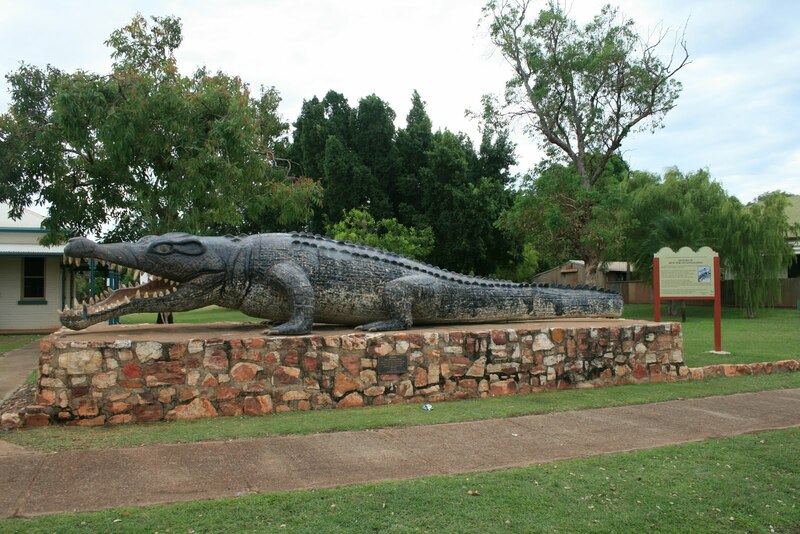 Jeida Francis, 23, said the croc was caught in Manangoora, an outstation 56km east of Borroloola in the mid '90s. 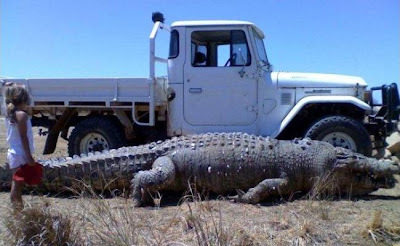 However, another earlier posting on the Internet seems to indicate the croc was in fact shot in the Albert River near Burketown, which is in Queensland. Which is only 500km away and just over the border. Rom and Nik Whittaker have written a very interesting piece on the world's biggest crocodiles on record, which can be read here. 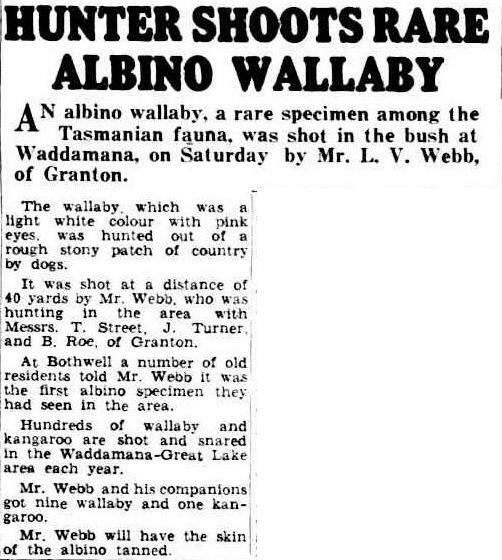 It reads in part: "The oft quoted 28 footer killed back in July 1957 by the Pawlowskis in the Norman River Estuary of the Gulf of Carpentaria remains just an unverified anecdote, no matter how many publications the story appears in. "Adam Britton and I (RW) measured two of the largest saltie skulls in Australia, one called ‘Charley’ at the Darwin Croc Farm (a ‘mere’ 64.4 cm) and one shot by Terry Holtz on display at the Corrorboree Tavern near Darwin. "This one measures 68.8 cm and is possibly the largest skull in Australia. Driving down the road we stopped in for yet another cold one at Bark Hut Inn, Annaburroo and there we found and measured just the mandible of a saltie 89.9 cm – bigger than the Corroboree mandible. Adam has heard of another croc skull in NT with a mandible of 96 cm (close to the size of the Paris Museum monster croc). The search continues for the largest Aussie skull. "News of an estimated 22 footer has also come from the Bullo River. We did see some 16 footers and one massive slide, but the Bullo giant is still out there." The Australian Dingo Conservation Association (ACDA) runs a 92-ha compound housing 31 pure, breeding dingoes on Colong station in the Blue Mountains National Park. "We try hard to maintain genetic purity, so we even separate our breeding packs into sub-types, like mountain, desert and tropical dingoes," says ADCA vice-president Gavan McDowell. The association's aim is to breed a number of pure dingoes that can be released into the wild to recolonise areas cleared of feral dogs. Unfortunately, since dingoes are themselves declared animals, or pests, in most states, releasing them for recolonisation is currently illegal. Some scientists, however, cautiously suggest the wild dog boom we have created may actually be the dingo's salvation. "People don't always realise that a lot of hybrid dogs means a lot of pure-bred dingoes too, simply because of the numbers," says Guy Ballard, a dingo researcher with the Invasive Animals Co-operative Research Centre. "It's impossible to prove, but I suspect there are actually more pure-bred dingoes around today than at any other time in history." Ballard's team runs several dingo-tagging projects throughout northeastern NSW, and he says that no matter where he and his fellow researchers go, they always trap some good (pure) dingoes. That's why he is uncertain of the need for breeding facilities such as that of the ADCA. 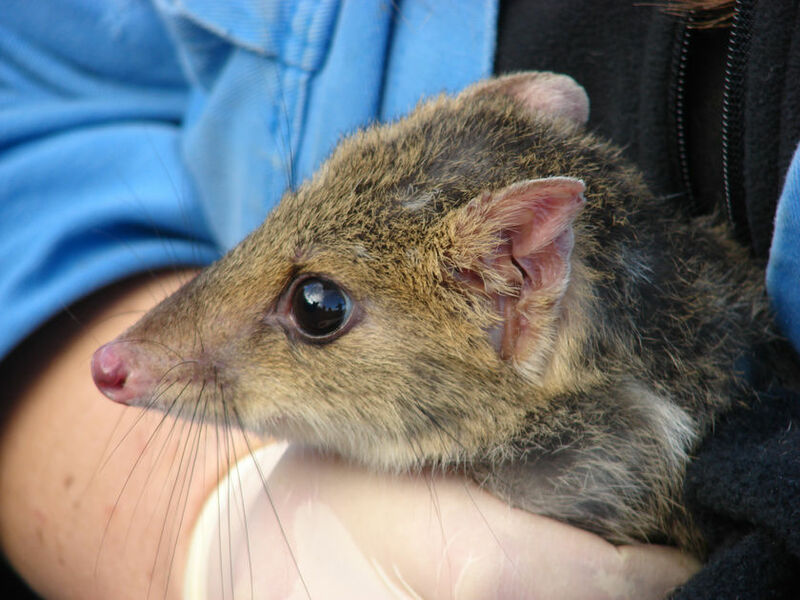 Eastern quoll numbers are declining in Tasmania, and scientists are worried. The eastern quoll is a carnivorous marsupial and is sometimes known as a native cat. 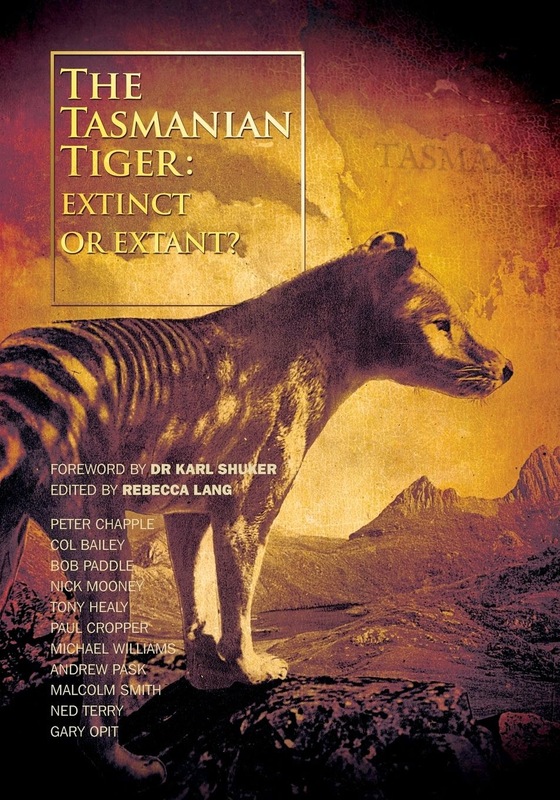 Scientists predicted quoll numbers would rise as the Tasmanian devil population was decimated by the facial tumour disease. But spotlighting survey work has shown numbers have fallen by half. The good folk at the CFZ are working like navvies to get the place ship-shape for the hordes that will descend on the place in just over a week to listen to all matter of Fortean strangeness. The CFZ will also host an open day for the public. You won't find a better distraction until October, when some of these weirdies reunite in London for the annual Unconvention - but why wait until then when you can enjoy the splendour of Devon and bottle the last of summer to boot? So if you love weirdness, forteana, big cats, crop circles, UFOs, bigfoot (the list goes on and on) buy your tickets NOW! They're selling fast! Tickets can be purchased here. Trust us - you'll never have it so weird! Weekly Times reader Malcolm Thompson was driving along the Manangatang-Ouyen Road in Victoria when he spotted this albino kangaroo and friend grazing in a paddock. "I couldn't believe it," Malcolm said. 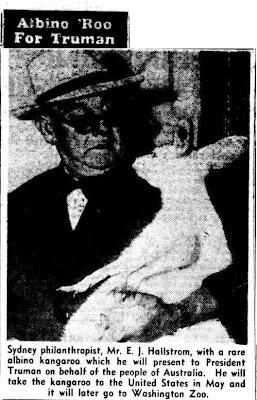 "I've been knocking around the bush for 40 years and I've never seen a white albino anything, let alone a white albino kangaroo!" Albino kangaroos and wallabies are not as uncommon as you might think. In Australia's infancy they were considered to be prized gifts to other countries and frequently shared headlines with world leaders. 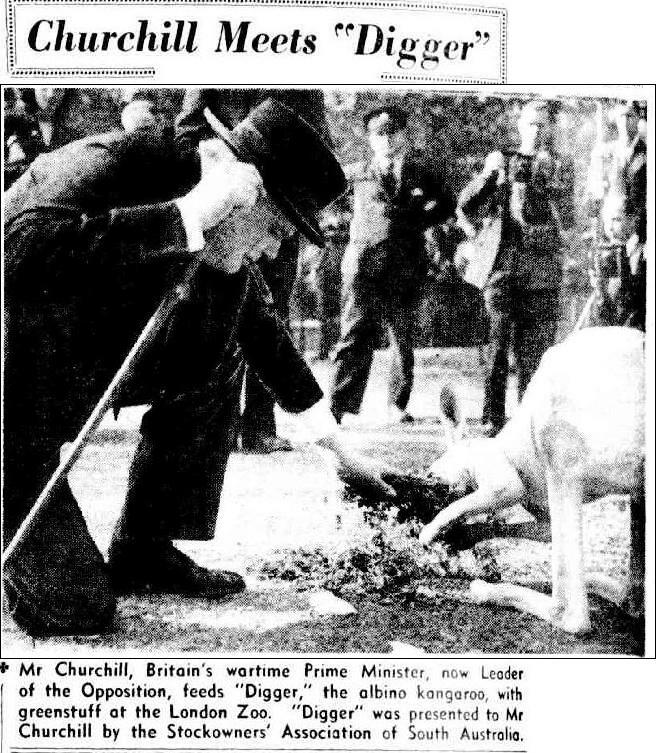 The sighting brings to mind the famous meeting between Winston Churchill and 'Digger' the albino kangaroo at London Zoo in 1947. 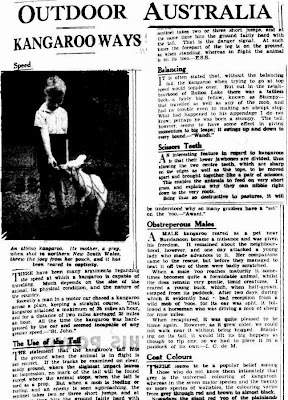 The CFZ have come across several old clippings about albino kangaroos and wallabies. 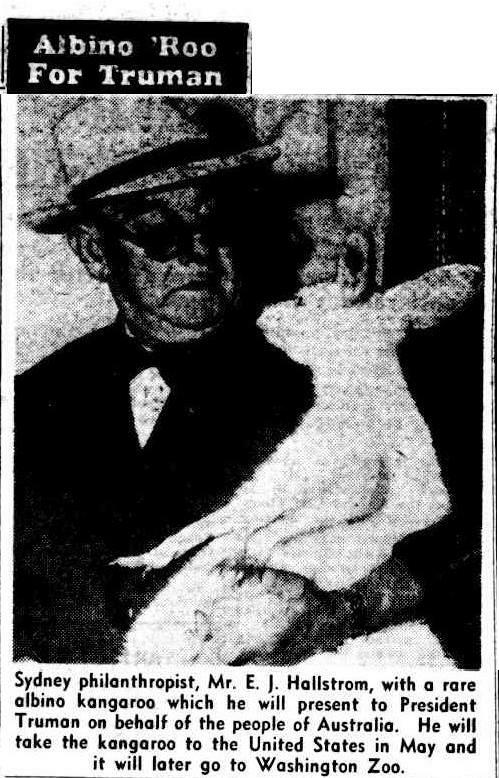 We also know Taronga Zoo founder Sir Edward Hallstrom also used to breed albino kangaroos at his property in Sydney, and gifted one to President Truman in 1952 - poor 'roo! Or was it a case of 'hoo-roo'?